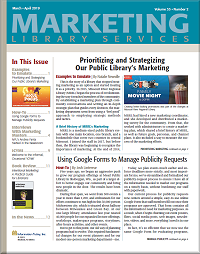 Marketing Library Services (MLS) emerged in 1987 and is the longest-running publication that regularly delivers how-to articles and case studies for marketers in all types of libraries. They’re written by practitioners from around the world and curated by a respected expert who has 20+ years in the field. These detailed, vetted articles deliver more value than the brief ideas and advice offered via social media. MLS covers strategies and tactics for all marketing-related topics: outreach, branding, segmentation, social media, funding initiatives, long-term campaigns, assessment, ROI, partnerships, promotional materials, program publicity, communications, PR, advertising, etc. Subscribers will also benefit from interviews with marketing masters, conference coverage, book reviews, and news.